Camo Fixed Blade Survival Combat Hunting Knife with Belt Sheath - A Military Combat Knife that doesn't wipe out your wallet! Equipped with a 4.75" 1045 surgical steel camo blade that reads, "JUNGLE KING". Handle features a compass on the end cap which unscrews to reveal a small survival kit (fishing hook and line, matches, thread). 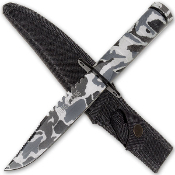 Both blade and handle are covered in a non-reflective camo finish. The sturdy nylon sheath attaches to the belt and holds the knife securely in place.